Share the post "Get all Request Parameters in Java"
In this tutorial, we’ll show you how to get all request parameters in java. Ideally, the server should know the parameter names that was sent by the client browser. I have created a simple Spring Controller that gets a request from the client and redirect the user to another page that displays all his request parameters and its values. In our Controller, we take a parameter HttpServletRequest which contains the client request including its parameters. 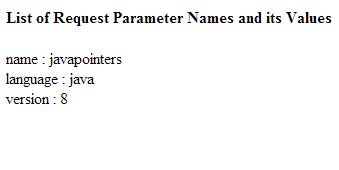 To get all request parameters in java, we get all the request parameter names and store it in an Enumeration object. Our Enumeration object now contains all the parameter names of the request. We then iterate the enumeration and get the value of the request given the parameter name.